Designing a theory of change* – we’ve all been there, right? It took hours of work from many team members – lots of back and forth, nuancing arguments, moving Post-It notes around the wall, wordsmithing, working with a design partner…but it was worth it – a gorgeous theory of change that not only motivates our staff towards pulling in the same direction but also works as a great communications tool for the work that we do. Time passes, things change, it takes a greater level of effort to explain the theory of change because some elements are no longer relevant, and it doesn’t capture important parts of our current work. We spent so much time and energy on developing it! We can’t change it – we don’t have that much time and energy to do that all over again. Our beautiful graphic comes to meetings but doesn’t get discussed, sits on a shelf, is moved into a drawer, and all of the benefits it once gave us – a point around which we could rally, a sense of shared direction, clarity around our goals and our role in reaching them – fade away. But that doesn’t have to be the end of the story! Last year, we worked alongside the International Decision Support Initiative (iDSI), a global network of health, policy and economic expertise working to help low- & middle-income Countries achieve Universal Health Coverage, in its efforts to return to its theory of change more than two years after the initial development, to bolster its relevance and utility to its day-to-day work. The impetus for changing the iDSI’s Theory of Change came from iDSI: as specialist evaluators, we brought our experience to the process, but they were driving the efforts. 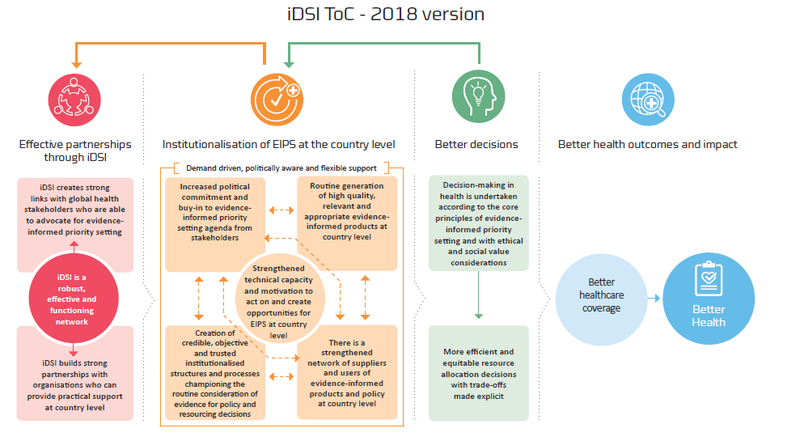 The drive came right from the top: the process was led by senior staff, who recognised the value that a credible theory of change could provide the iDSI network and the wider field of evidence-informed priority setting for health. The motivations for the change were clear and compelling: iDSI wanted to ground its theory of change in the wider literature on building capacity to institutionalise priority setting in order to increase its credibility, and to test some of its implicit working assumptions. Partners from across the iDSI network were involved in the process: wide participation in reworking the iDSI theory of change including from low- and middle-income country partners meant there was strong support for the final product. It was the right moment to revisit: a few years into a major grant, it was a good moment to step back and take a critical look at what the network had learnt and what that meant for its strategic direction. Itad has been lucky enough to work with iDSI as a monitoring, evaluation and learning partner from the early days of the network’s establishment. This enabled us to be an active participant in the journey from the first iteration of the iDSI’s Theory of Change to this most recent revision. The graphics below provide a sense of the evolution over time. A link to a full report on the process of revising the ToC is here. We have been impressed by the energy and commitment iDSI have given to this evolution and have been encouraged by hearing iDSI increasingly refer to its Theory of Change when discussing how it is implementing its work and planning for the future. In fact, in iDSI’s recent successful grant application to the Gates Foundation, iDSI linked its results framework to the Theory of Change. We think these examples highlight the real value of a theory of change, and something we try to emphasise in the work we do: it’s not about the beautiful graphic – that’s just the product that articulates a much more important process. Have you thought about changing your theory of change? Have you taken the plunge? How did your experience compare with ours? We would love to hear your reflections on this discussion and compare notes! This blog was originally published by iDSI.